Leaving the farm, heading out – in search of education and the rest of the world. During the last decade of the nineteenth century, these departures accelerated among young Americans. The trend concerned President Theodore Roosevelt, who hoped to persuade young men and women to stick with the agricultural life. In 1908, TR appointed the Country Life Commission, chaired by a brilliant Cornell University botanist with the inimitable name of Liberty Hyde Bailey. Bailey’s report contained three basic recommendations. Next, organize and expand agricultural extension work by colleges and universities. Finally, initiate a campaign to rebuild country life and spur “rural progress.” These ambitious plans launched the country life movement, which persisted with limited success through the New Deal. Of course the children of farmers continued to get away. A large number became educators in urban areas, an essential development considering the exponential rise in public school enrollment. Many were fine teachers with interesting stories to tell. Born in 1892 in Clark County, Illinois, a region that contains the most fertile soil in the United States, Taubeneck grew up on a farm. His uncle, Herman, became national chair of the Populist Party and worked closely with a quirky Minnesota politician, Ignatius Donnelly, who made the fateful decision to endorse William Jennings Bryan for president in 1896. By throwing in the Populists’ lot with the Democratic Party, Donnelly ensured the demise of the People’s Party, as the Populists also were known. Ignatius Donnelly served in the U.S. House and Minnesota legislature, as lieutenant governor, and as a state lecturer with the Minnesota Farmers Alliance. He championed the Freedmen’s Bureau after the Civil War and was a brilliant orator. He also wrote futuristic novels. But in 1918 he changed his mind, shipping off to France with hundreds of other young men from southern Illinois. He served as a first class private in the machine gun company, 58th Infantry, Fourth Division. 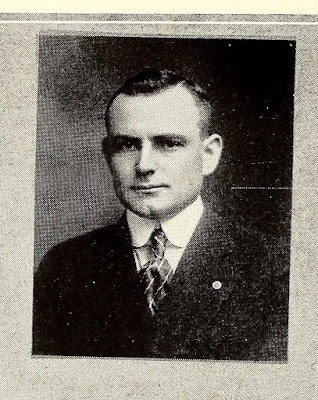 “He was on his way to the front, and within the sound of the firing when the armistice was signed,” the Illinois State alumni magazine reported. Instead of returning home, however, Taubeneck joined the faculty of a university that the American Expeditionary Forces organized during demobilization. This will surely sound remarkable because nothing like it could happen today. After the war, the YMCA handed off the program to the Army, and a special commission oversaw the creation of a campus and curriculum at Beaune, France. Nearly 10,000 soldiers – the sole requirement was a high school degree – attended classes there between March and June, 1919. The faculty of 300 included Taubeneck. Eventually, he went home to Illinois and taught at his alma mater until a school superintendent in the New York City suburbs hired him as a high school teacher. Among the many things I.D. contributed to the community was his habit of prophecy. He would predict the results of presidential elections and major national and international events. Each prediction would be sealed and placed in a safe deposit box. By 1942, when The New Yorker wrote him up in “Talk of the Town,” Taubeneck had aced 57 major predictions and 83 minor ones. That sounds just about right for today.